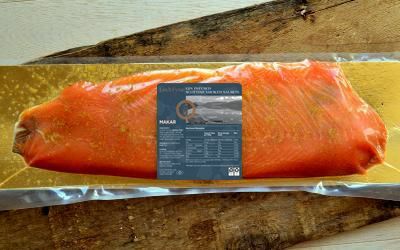 Cured with sea salt and sugar, then gently infused with Makar Gin. 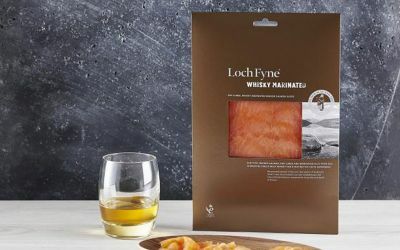 Fresh Loch Fyne Scottish salmon fillets are dry cured with salt, sugar and infused with award-winning Makar Gin before being smoked over oak shavings from retired whisky casks. The result is a distinctive, refreshing taste experience, with notes of juniper, black peppercorn and citrus. This product is ready to consume without cooking. Remove from pack 10 minutes before serving. An aormatic and flavoursome smoked salmon. 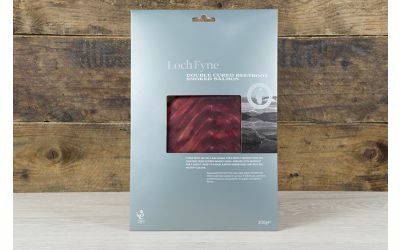 Serve with rye bread and butter or with pickled cucumber and beetroot. 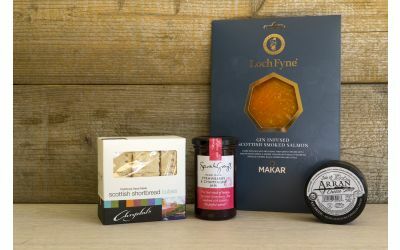 Scottish Farmed SALMON (FISH) (Salmo salar) 91.8%, sea salt 2.5%, lime zest 2%, gin (46% abv), orange zest, sugar, black pepper, juniper.